We heard it crack and then fall, kicking up a huge cloud of snow and ice. The party ahead of us appeared to be right beneath it. Snow Dome had just calved another piece of glacier off its high cliffs. The huge distances and proportions made it hard to judge, but luckily the other party was well clear of the hazard. The debris flow stopped a few hundred meters from the skin track that wound its way up the Athabasca Glacier. I was there. I mean; I was finally doing it! 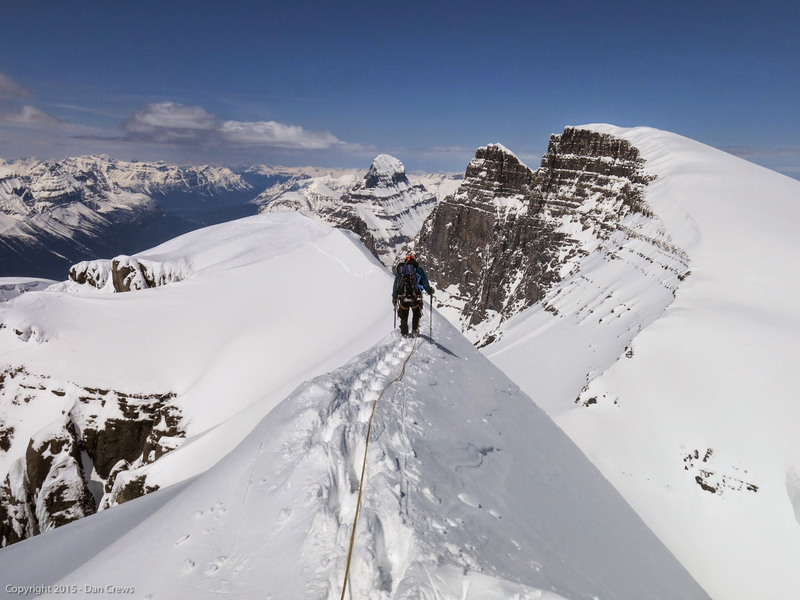 We were heading up the Columbia Icefield on an ambitious mission to bag six big summits, Mt. Columbia included, in a period of five days with three good team mates. For me, it all started with a ridge scramble five years ago. The feeling of freedom seized me to the core, and the overwhelming desire to explore higher and further would transport me through a fitness and skill-building journey. Right from the beginning the long term goal was Mt. Columbia. 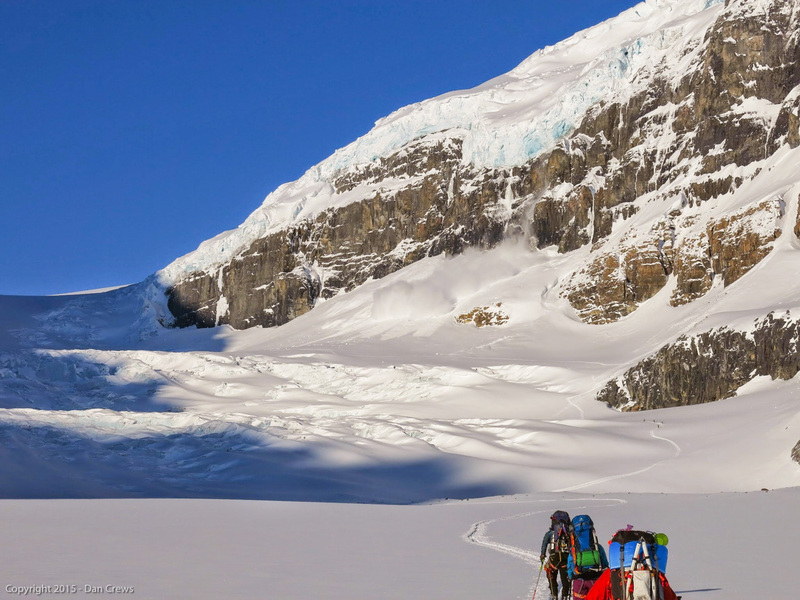 Scrambling, rock and ice climbing, back country skiing, winter camping; I set out to learn it all in order to prepare myself. On May 5th, 2015, I got the call. Our weather window was here. Time to pack up and set out! A funny thing happens on the vastness of the Icefield; not only does scale of space get distorted, but time also seems to get stretched and compressed in such ways as to become almost irrelevant. So it was in this state of meditation-in-action that we plodded our way up the ice falls of Athabasca Glacier and onto the Icefield proper. 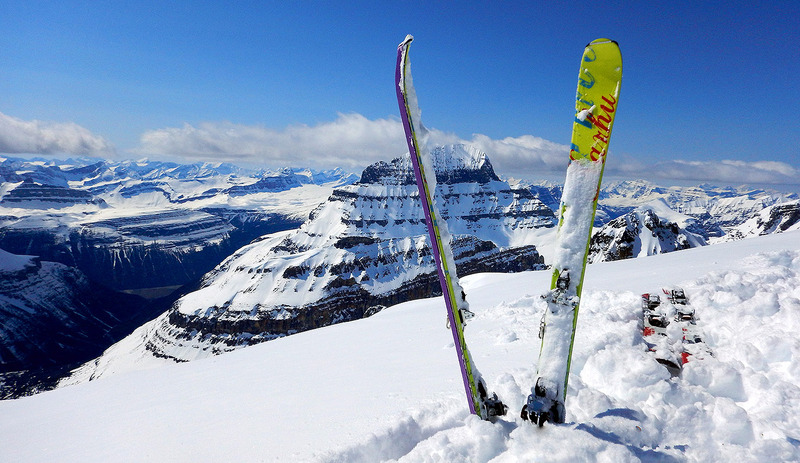 The first glimpse of the Icefield’s giant, Mt. 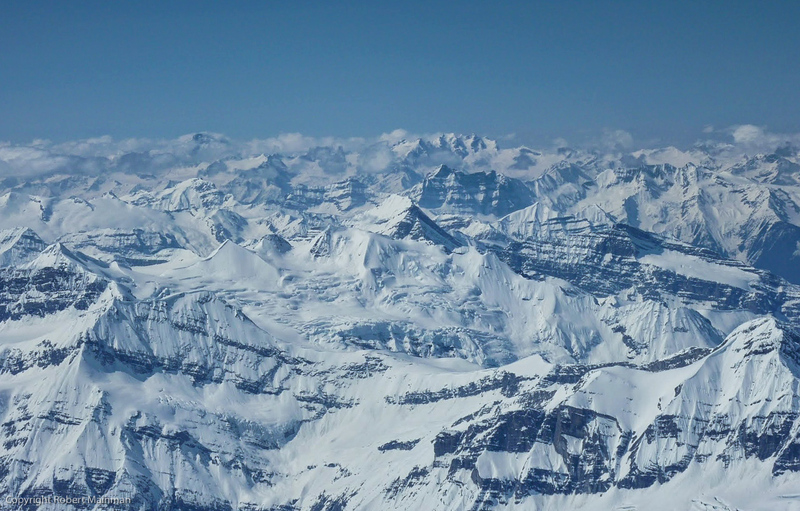 Columbia, and the vastness of the Icefield itself were stunning! This would be the world we live in for the next five days. One after the other, the peaks of the Columbia Icefield revealed themselves as the sun rose high in the sky and then fell again. By the time we reached our base camp coordinates, some nasty weather was coming in. 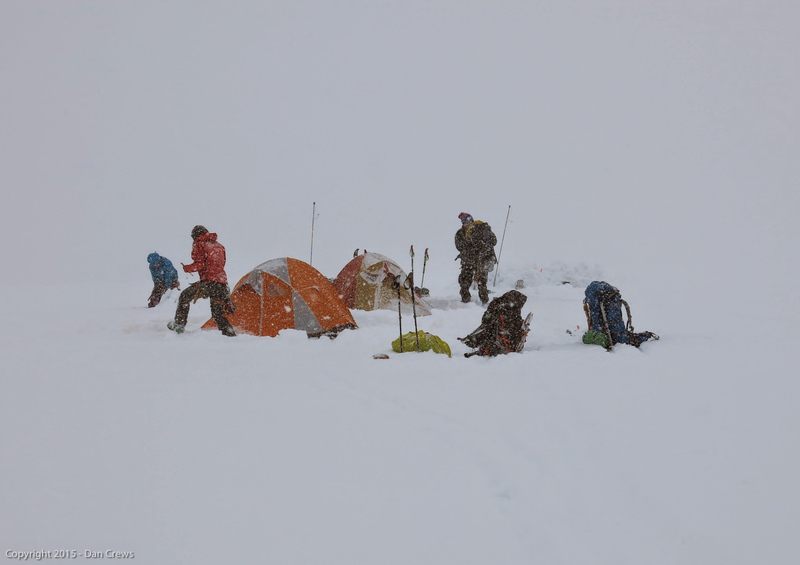 We promptly established camp and quickly ate supper in the developing blizzard before retiring to our tents. 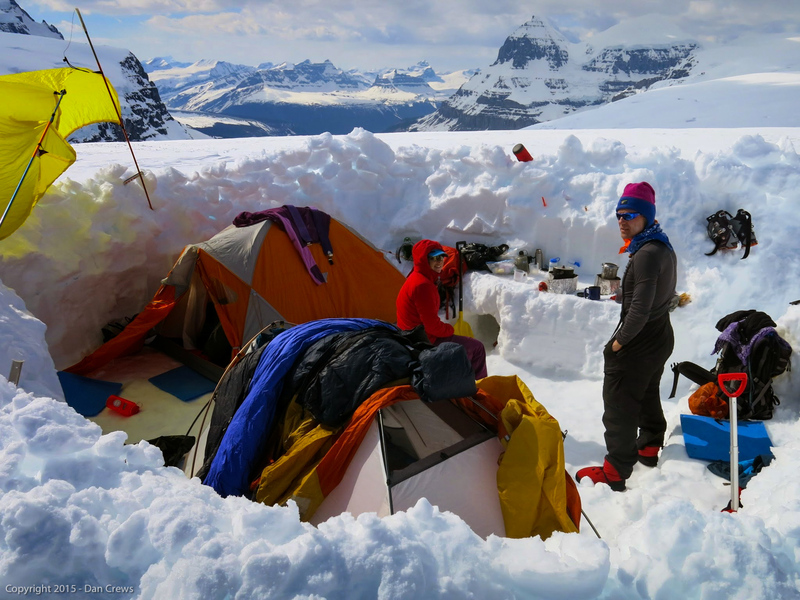 That night, I would go out twice to shovel the accumulating snow off of the tent’s walls. The previous night’s storm had passed and a beautiful sunrise greeted us on our first peak-bagging day. That would be the end of bad weather for the rest of the expedition. The fresh 15 cm (6″) of windblown snow made good work of covering any tracks that had been made the previous day. We started toward West Stutfield on a fresh canvas, crisp air in our lungs. The terrain to West Stutfield is gentle, following contour lines and gently angled slopes. Although summiting West Stutfield is quite benign, the views of the North cliffs of North Twin and Twin Tower are absolutely spectacular! And so it was that around noon on May 9th we summited our first mountain. We continued along, northbound, toward Mt. Cromwell. 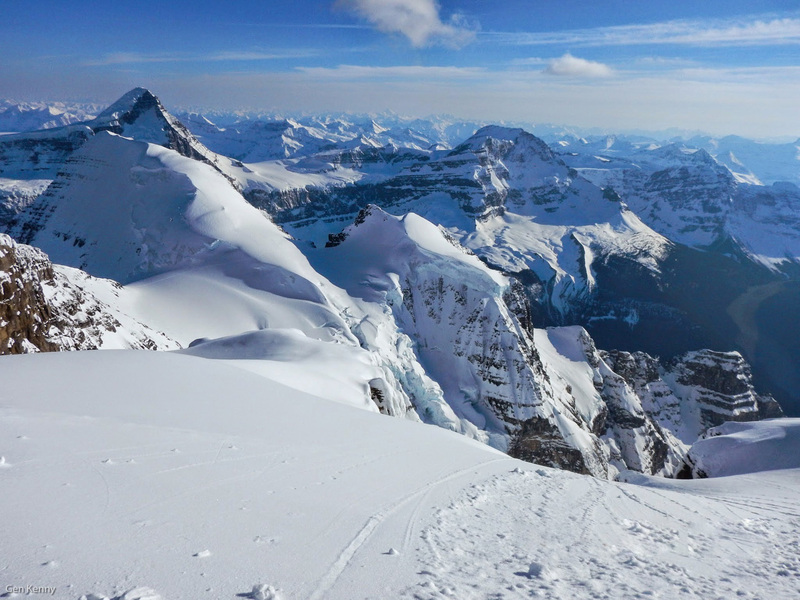 This summit is often snubbed by Columbia Icefield Peak baggers for a few reasons; it’s quite a detour, it’s not glaciated, and most of all, it’s not an 11,000’er! I might have skipped it too if it weren’t for team-mate Robert who insisted we do it. We weren’t disappointed! The previous night’s blizzard deposited the perfect amount of snow on this South-facing slope and we got to make some great turns; easily the best of the trip! The views from this summit included front row seats to Mt. Alberta and Woolly and Diadem among others. The return to base camp that day seemed never-ending, as we had to re-summit West Stutfield to get back. The same 11,000’er twice in a day?! Yes, that’s crazy! We were all so tired that evening we barely had energy to eat supper. Our first peak bagging day had gone off without a hitch and we were in a hurry to get to sleep to be ready and rested for the next morning. I woke up feeling great. I was fully rested, acclimatized, and genuinely stoked for the day ahead! The sky was clear, the weather mild, the wind gentle. The morning routine was efficient and we were ready to set out in good time. On the menu today; South Twin, West Twin, and time permitting, North Twin as well. I was fully engrossed in the high alpine routine, breathing easy, and happy as can be in this cool bright environment. My team mates were all in good spirits and we set out for the day, smiling light-heartedly. The scenery approaching the Twins was spectacular. We had uninterrupted views of Mt. Columbia to the South, and it was beautiful! As we gained elevation contouring the base of North Twin to reach the North-South col, the Trench glacier gave away its secrets and we could soon see its gigantic icefall, and beautiful turquoise lake below. The high steep East face of South Twin above it was imposing, and the long summit ridge stirred up butterflies in my stomach in anticipation of the climb to come! It took several hours to get to the col, but the grade was mostly easy, and both snow and weather conditions were exceptional. The freshly deposited snow was making our travels much easier. We were able to make confident boot steps where necessary and our skins stuck well to the snow. No need for ski crampons. Even on the technical West face of South Twin our footing was good and any front pointing was also snow supported. We gained the long summit ridge easily, and had a breathtaking final walk to the summit along the snowy knife’s edge. The exposure was obviously unforgiving so it did require full attention. In spite of the objective danger, I felt calm, confident, and couldn’t imagine anywhere else I’d rather be at that moment! 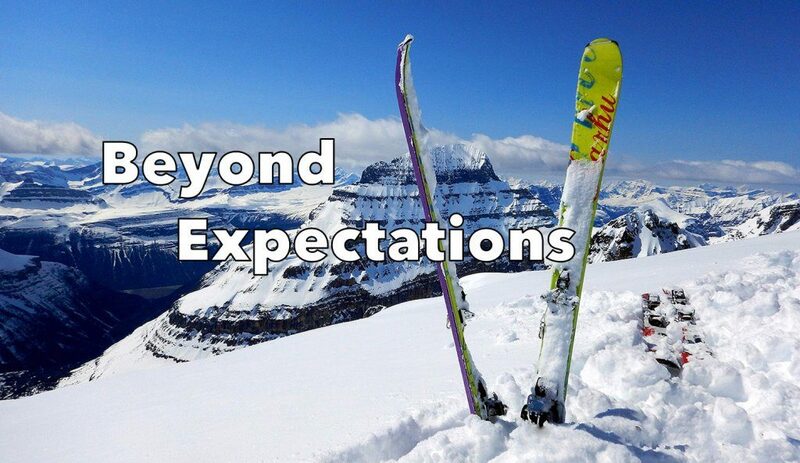 Living in the present moment becomes easy when fully immersed in the alpine environment. When all is going well, one can experience moments of pure happiness and perfect contentment. In those moments I often find myself marveling at the perfect awesomeness of our planet, and how lucky I am to be able to experience it the way I do. After a few pictures on the cramped summit, we headed back down to our skis and skied to the South-West Col to bag West Twin. West Twin looks insignificant in comparison, but is still considered a separate 11,000’er, and is quick and fun! The ascent face was steep snow, kept nice and dry from being on the shaded side. We did fast work of kick-stepping up and got a really nice view of the West side of South Twin as well as the large green valley below on the BC side. And back down we went! We got back to our skis and regained the South-North Col by 5:30 pm. After very little discussion we decided to continue and summit North Twin, since we were in the neighborhood! The route up North Twin is a non-technical ski ascent on relatively soft grade and we were able to skin up easily and made the summit, our third of the day, by 7:00 pm! One look over to the West side convinced me that I wouldn’t regret not having attempted the Twin Tower! Again the scenery was worth a million bucks, and the low angle of the sun made for very relaxing views. At just over 12,000’, North Twin’s summit sits higher than anything else in the area, save Mt. Columbia, our final objective of the expedition. 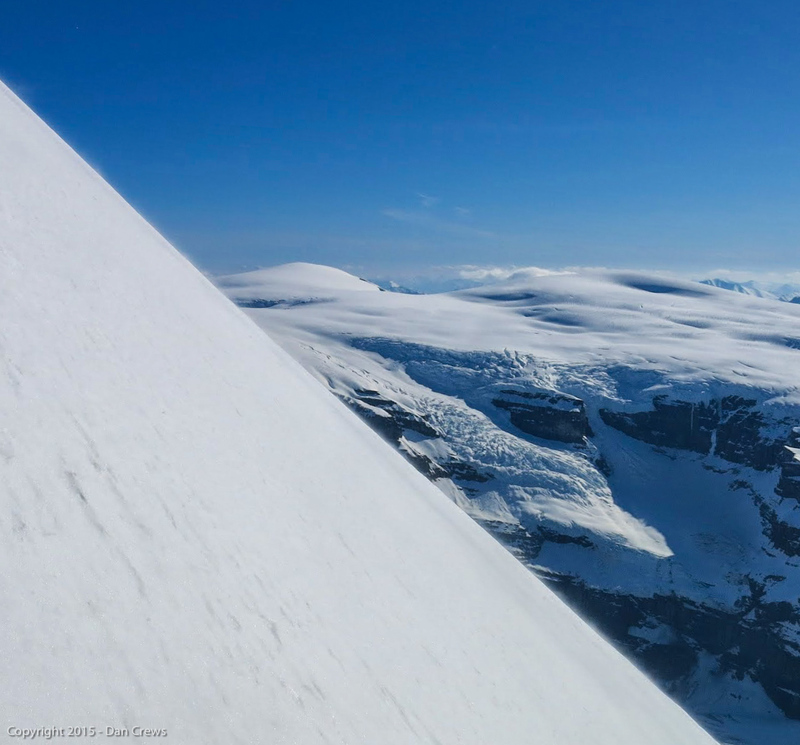 We descended the East slope of North Twin on unpleasantly hard wind-blown snow, but we did fast work of it. We got back to base camp just before sunset. Day four would be a “rest” day without summits, so we stayed up a bit longer that night and reminisced on the past few day’s accomplishments. That night I experienced absolute silence and pure amazement. I stepped out of the tent in the middle of the night and a great big “wow” escaped my lips as I saw the night sky. It was as clear and as star-filled as I have ever seen it! So bright were the stars that I had trouble spotting the Big Dipper! Looking to the North, I saw what could only be described as a fuzzy white rainbow, arching over the magnetic North; the calmest Northern Lights ever. The Icefield and all of its peaks were gently glowing in the star light, and the air was so still, the night so silent, I could hear my own heart beat. I stood there, in my hut booties and big down jacket, marvelling at this beauty for a good half hour before reluctantly pulling myself away, back into the tent to sleep. 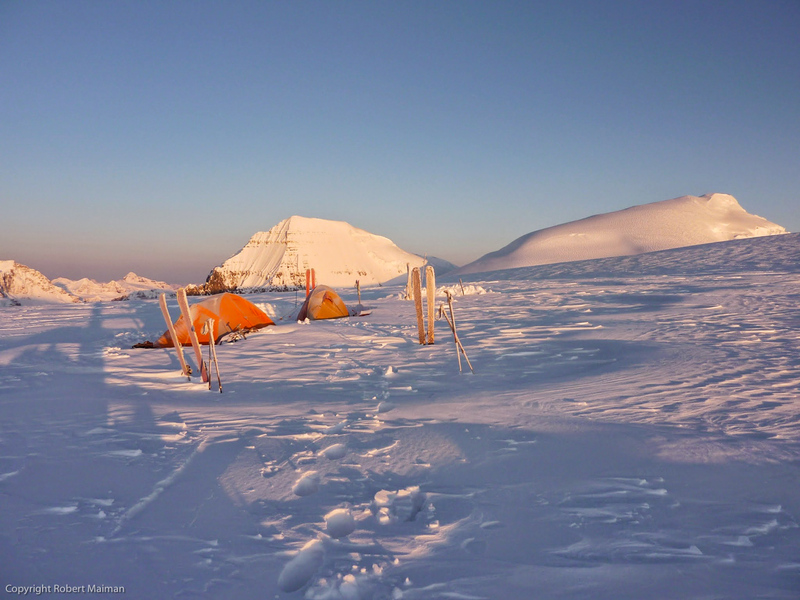 The extra few hours of sleep felt great, and we had a leisurely start to the day, but now it was time to pack everything up and move camp above the Trench for the next and final objective of the trip; Mt. Columbia. It was quite reluctantly that we shouldered our 50 lbs backpacks for the move, but it would only be for a few hours, right!? 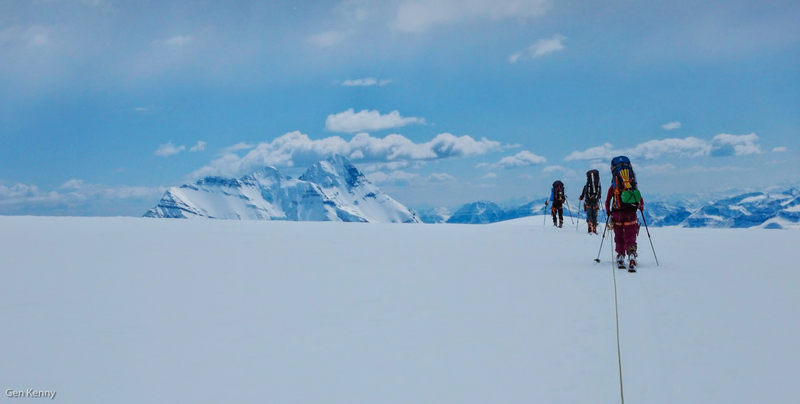 However, the morning’s perfect weather quickly turned into an easy-bake oven environment on the Icefield, and things got uncomfortable quite early on into our move. 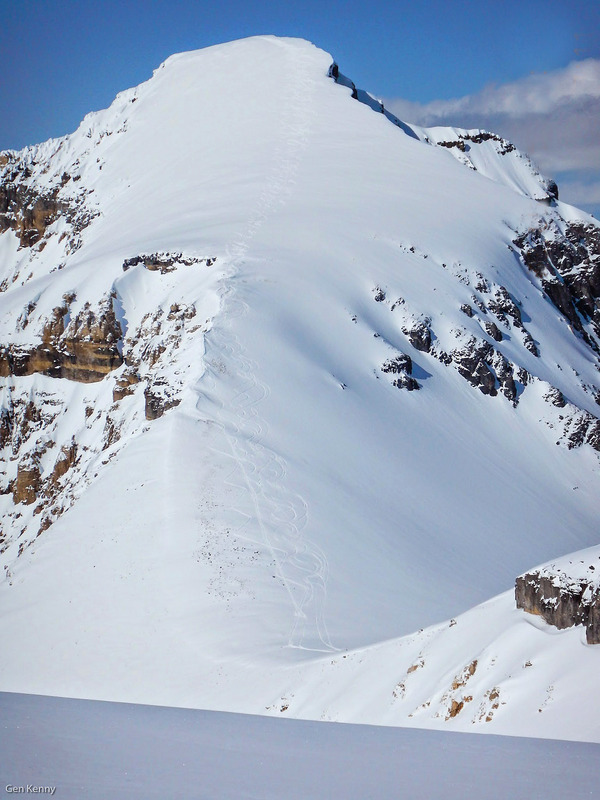 The snow was too sticky for skins, and the supposed flat contour lines were anything but! Sometimes going slightly uphill, slipping at every push, and sometimes slightly downhill… The uphill was tiring, but the downhill was downright frustrating! My light frame combined with my heavy backpack made for challenging maneuvers at the back of the rope team. Those who have been in that position can surely relate! Needless to say, the heat of the day was wearing on everyone’s good disposition. What came into view around 3:00 pm, in the intense heat of the afternoon, seemed too good to be real at first; were our eyes playing tricks on us?! 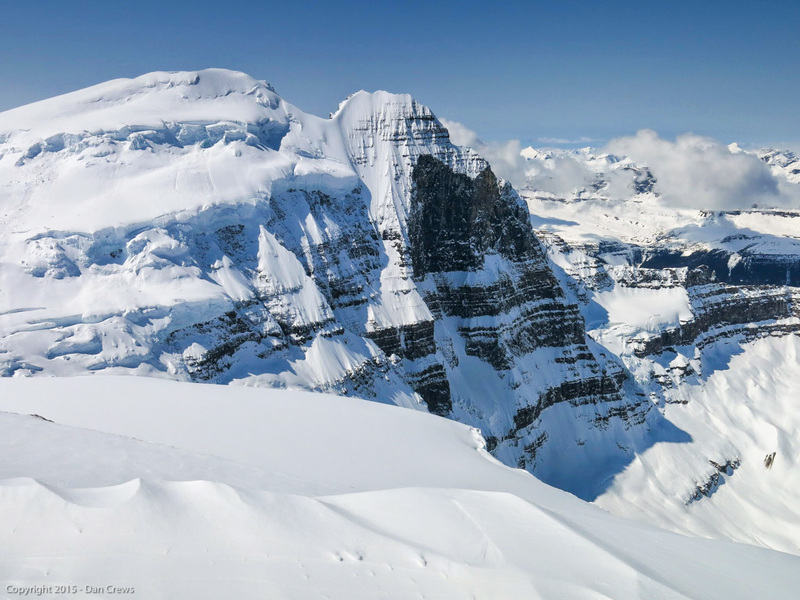 What we found was an Icefield architectural wonder! We dubbed it Hotel Columbia; a huge dug out campsite, complete with wind breaks and kitchen, and big enough to erect two two-man tents in its walls. This would save us a few hours of labor, allow us to rest, and immediately lifted our spirits. Once we got all settled in the “hotel”, we had a very comfortable dinner while admiring our final objective. …just hours away from ascending the mountain I had been preparing for these past five years. It was an emotional evening, recalling the journey that got me here. A lot of people, good people, came into my life as a result. Great lifestyle changes were made, priorities were sorted and realigned. Pursuing this goal also resulted in finding happiness. I had found a way to express myself and experience the world in a unique and awesome way. I fell asleep easily that evening, with a smile on my lips. I heard the alarm ringing in the neighboring tent; it was 2:45 am, time to get up! 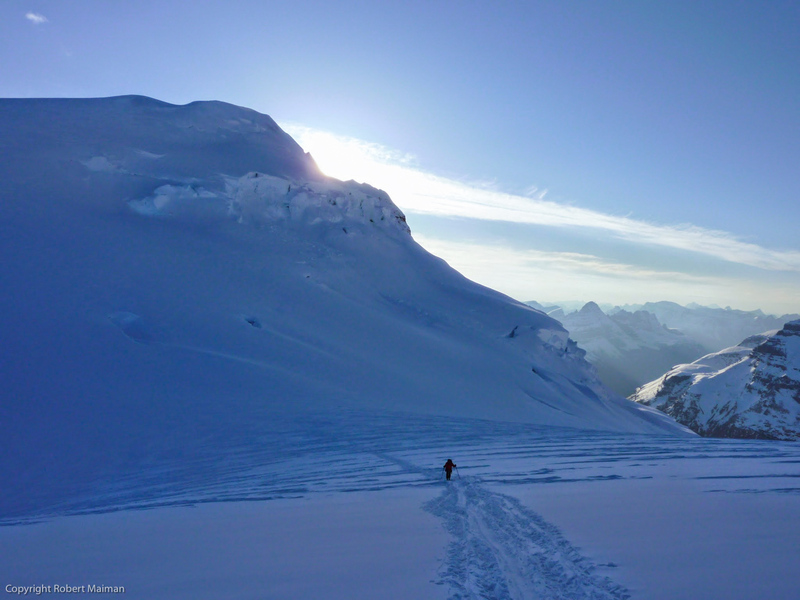 This was now my fourth morning on the Icefield, but our first true alpine start. It would be a very long day, as we needed to come back to Hotel Columbia after our summit bid to pack everything up and make it back to the road before dark. Rob was on water duties, filling all of our bottles as we got dressed and geared up. He always managed to get ready before anyone else. How he does it is a mystery to me! No matter how I try to be efficient, I just can’t beat his time! By 4:00 am, we had our skis on and were heading down into the Trench. It was dark, but only for a short while. Slowly, daylight came to greet our efforts. Later, as perfect timing would have it, just as we crested out of the Trench and Mt. Columbia came into full view, everything started glowing pink! We got there just in time for one of the best shows the mountains have to offer; alpen glow! The approach took some time, and the mountain kept growing bigger and bigger. We did finally arrive at the base of the face, ditched our skis, and donned our crampons and tools. All we had to do now is climb up this huge snowy incline. Rob took the lead and kicked steps, I followed after him. Vicki was behind me, with Dan bringing up the rear. With each step, time started to lose its meaning as I slipped into the rhythm of the climb. There’s a purity to it, to only have one thing to do, and to do it efficiently. The heart steadies, the movements become fluid, effortless. That’s when the world reveals itself in all its wonder! I realized what was the key to this experience being so wonderful; proper preparation and fitness. Without that, I’d be struggling in sweat and pain, and the magic would be lost. I had so much to be grateful for in those moments as I was going up Mt. Columbia. A brisk wind two-thirds up the face brought me out of my meditative state. Finally, nature gave us a bit of a taste of alpine ruggedness! The wind carried with it ice crystals that blasted our cheeks, and made us stop in our tracks for a few seconds at a time while the gusts blew by. I smiled. It felt great, and the summit was so close! Two more kick-steps, and I plunged my axe onto the summit flat. I got up on my feet and stepped away from the edge, belaying Vicki onto the summit as I did. The wind that had tested us earlier was now calm, and the sky clear in all directions. The whole of the Icefield lay at our feet, trimmed with giants that now looked rather insignificant! The thin air somehow felt rich in my lungs, and every breath tasted of freedom. We had started the climb shortly before dawn, but I had been on the approach for five years. Needless to say, I felt pretty elated! We all did. Hugs and High-Fives were had all around. We took advantage of the exceptional summit conditions and stayed a good long while, admiring the views that stretched as far as Mt. Robson to the North-West, and Temple to the South-East. We had a bird’s eye view of every other mountain we had summited in the past few days, as well as countless giants and icefields all around us. I could have stayed on the summit all day, but we still had a lot of terrain to cover before sunset! 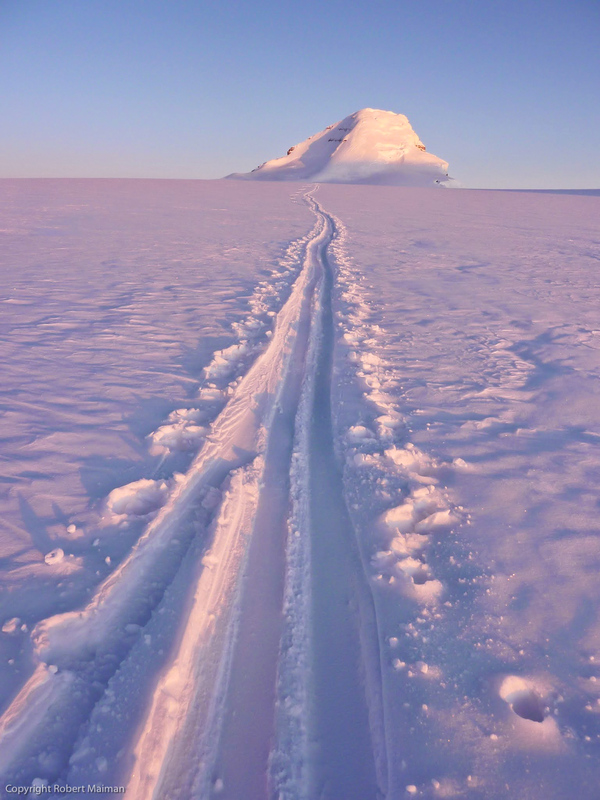 We headed back down the face, got back to our skis and slowly made our way back to camp. It was still before noon. On our way, we encountered an overly prepared group with big backpacks, pulling pulks filled with bamboo wands, and wearing nose shields. They seemed quite impressed that we travelled so light and that we had already bagged The Big One at such an early hour. We, on the other hand, were grateful GPS technology had replaced wands as a preferred means of navigation! Later, as we left Hotel Columbia behind, I believe I saw its next guests approaching in the distance. 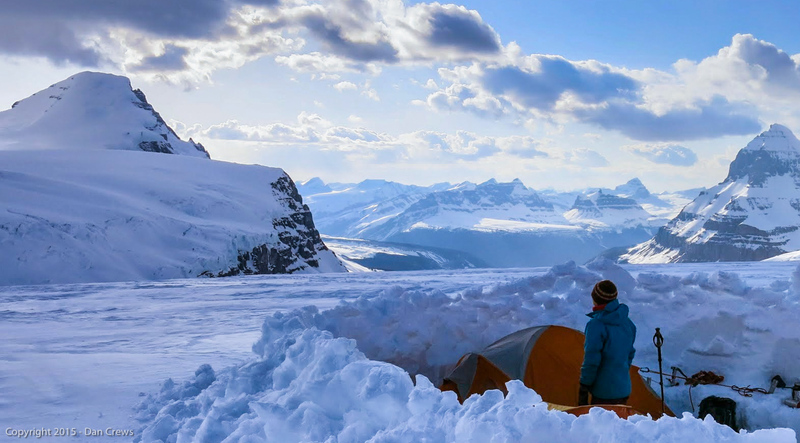 I think we all wanted to stay on the Icefield a bit longer. We discussed how the main limiting factors were how much food and fuel we could carry in, and how much solar radiation we could handle. At that point, we all had raccoon eyes, chapped lips and nostrils, and even managed to have the tips of our tongues sunburnt to various extents! The fact that none of us had changed clothes in five days didn’t seem to factor into the limiting equations, yet! We made our way toward the South-East corner of the Columbia Icefield and down the Saskatchewan Glacier. We navigated around monster crevasses and huge sags. As we came down the longest green run in the Rockies, the snow got progressively thinner and warmer, and started to grab at our skis, making turning increasingly difficult. By the time I reached the toe of Saskatchewan Glacier, my legs were reduced to a puddle of their former selves! 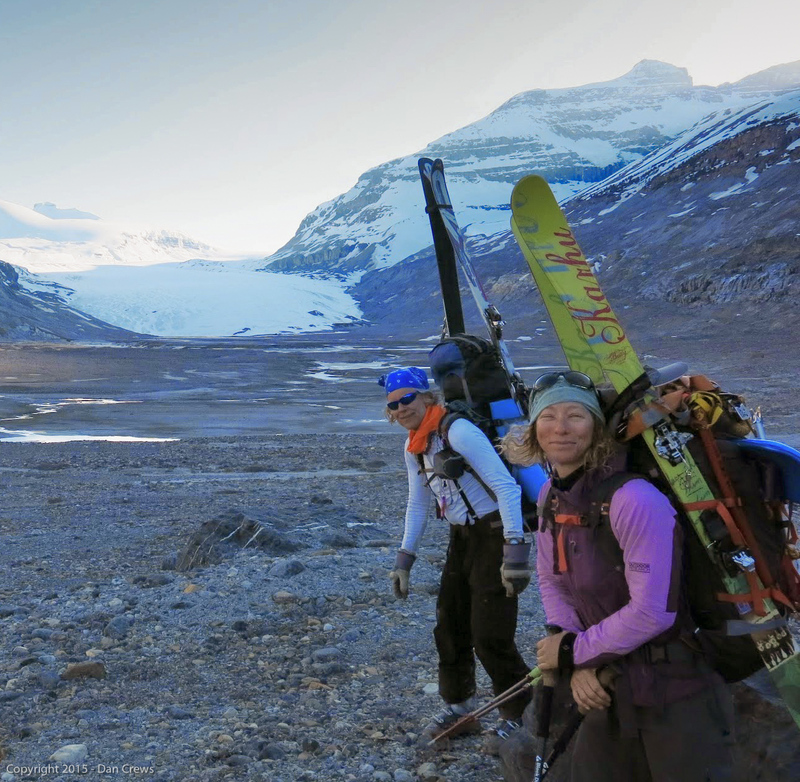 All that was left between us and the road at that point was walking about six km of low moraines and riverbed to be negotiated in ski boots, with a few desperate patches of skiable snow scattered about. This was followed by the final stretch along an out-of-service narrow treed road, where we’d ski on a 50/50 mix of slush and pine needles, and finally, a small river fording. So, not quite home-free yet! We stubbornly pushed through this last miserable stretch, at the edge of our limits. Invariably, as I return from a trip with pain in my body, worn thin, I ask myself: “Why do I do this?” Why do I chose to throw myself into this remote hostile environment? Why do I force my small frame to carry 40% of its body weight? Why do I willingly eat questionable freeze-dried meals? 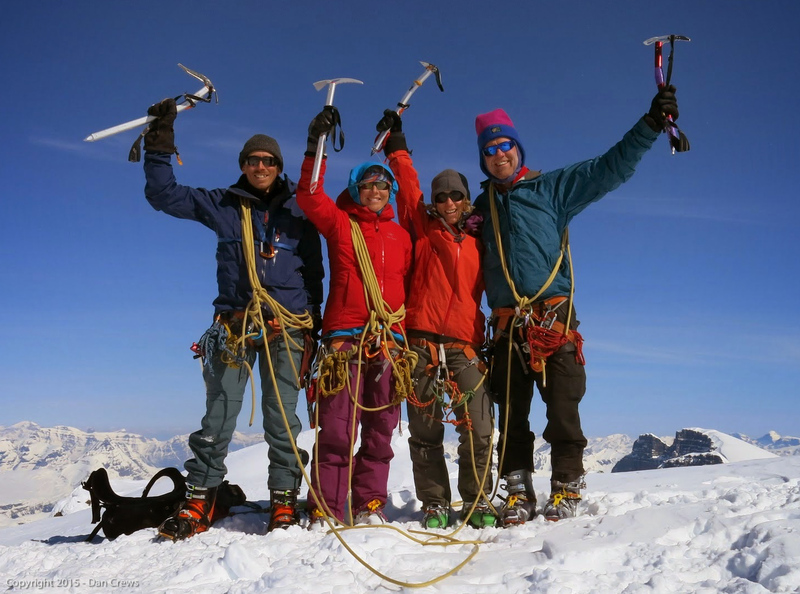 The reasons that bring each of us to pursue mountaineering may vary greatly, but we all share an indomitable spirit and a thirst for adventure that cannot be satisfied within the boundaries of our modern world. So we set out, with heavy packs and light hearts as often as possible, in search of adventure. What we often find is ourselves. This little expedition turned out to be so much more than I had hoped for. All I had wanted was to summit Mt. Columbia, but got the chance to climb five others. The weather could not have been any better. The company that Vickie, Rob and Dan provided was wonderful. The trail breaking that was provided by Vern Dewit, H. Steven Song and company, who always seemed to be just a few hours ahead of us for the first three days, made for much easier travel (thanks guys!). All of that ensured this experience exceeded all of my expectations! I am Gen, and I’m a summit seeker.